The last few hours have seen much of the K-pop fandom in an uproar following news that Jessica had allegedly been unceremoniously dumped from SNSD; and now, after many hours of silence, SM Entertainment has confirmed this news. Jessica will no longer promote with SNSD, but will remain under SM while pursuing solo activities. It was initially believed to have been the work of a hacker, especially considering the time the posts were made — 6AM this morning, KST. Sure, idols have to be up early for their schedules, and SNSD did have a fanmeet in China today, but would SM really be contacting their idols to say “Yeah we’re kicking you out byeeeee” that early in the morning? That SM, along with Jessica and the rest of SNSD, would communicate that these posts were the work of a hacker seemed reasonable, and so fans waited. However, as time passed and SM’s silence grew longer, fans looked to anything to confirm or disprove the Weibo posts. Perhaps Jessica or a manager would delete the posts, or the situation would be explained by the other members on their own SNS accounts. What they got instead was every Soshi except Jessica at Incheon airport, preparing to attend their fanmeet in Shenzhen. Soon, Dispatch arrived on the scene to reveal that Jessica had flown into South Korea at 4AM the morning before from New York, with boyfriend Tyler “The Forehead” Kwon in tow. It’s said that Jessica was away on personal business, and had come back to attend the fanmeet. 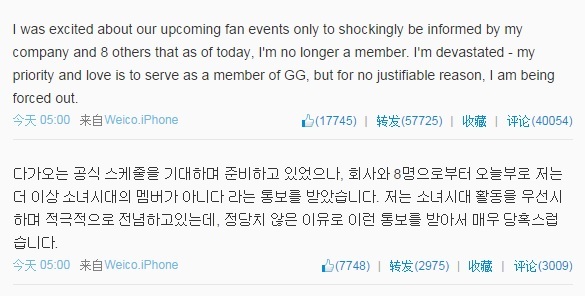 However, she was apparently issued a “thanks, but no thanks” from SM and (apparently) the other eight members of SNSD. Jessica will likely now focus her attention to her fashion line Blanc. This business of hers was seen as one of the ways in which Jessica was preparing for her post-Soshi life… just not so soon. Or on SM’s terms and not her own — though Sica at least managed to get a word in via social media before SM could say anything, likely throwing them off for a good few hours. It remains unclear exactly why SM decided to remove Jessica from the group. Going by the Weibo posts above, this did not sound like an entirely mutual decision. With other SM idols like Yesung having their own fashion stores and labels, it would seem unfair, and unlikely, to target Jessica for starting her own; perhaps they didn’t like Sica taking spending time on her personal affairs, but if it’s not affecting her SNSD-related engagements, then there doesn’t seem to be much reason for SM to be against how she wishes to spend her time. Tyler Kwon isn’t popular among many fans, but punishing Jessica like this for her taste in men also seems rather far-fetched; that said, this could be a pre-emptive measure undertaken by SM in the event that Jessica and Tyler do tie the knot, though they do not seem to be engaged right now. The only other active female idol to have married is now on hiatus and her group effectively broken up; SM may be wanting to avoid the same fate for their flagship girl group, though it’s difficult to say if Jessica had as much influence on SNSD as Sunye did with the Wonder Girls. Though, of course, there may well be more to the story which would explain why SM would officially kick Jessica out of her group while others like Sulli are on indefinite hiatus. In any case, I wish Jessica all the best in her future endeavours. While she is now more or less in the same situation as Super Junior‘s Kibum — except for the fact she is officially out of the group — I believe Jessica will remain relatively successful with her activities. Even if SM attempts to relegate her to the sidelines as they have done with Kibum, as a way to make an example of them to other SM idols to quash any hopes of regaining some control over their careers from the company, Jessica has been smart enough to cultivate a (perhaps modest) fanbase in China through Weibo. If no one in South Korea, including Sones, supports her, she will at least have China. It’s been a crazy day in a crazy year for K-pop — and SM in particular. Readers, what do you think of this sudden turn of events? What are your thoughts on SNSD continuing as eight?